WASHINGTON — So much for an abrupt U.S. pullout from Syria. One month ago President Donald Trump surprised many, including some in his own administration, by announcing, “We’ll be coming out of Syria, like, very soon. Let the other people take care of it now.” He insisted that the time had come for the U.S. military to shift its focus away from Syria. But on Tuesday, it was clear that something or someone had changed Trump’s mind. The president said at a White House news conference with French President Emmanuel Macron at his side that before the U.S. withdraws from Syria, “we want to leave a strong and lasting footprint.” This long-term approach, he added, was “a very big part” of his conversation with Macron, who told reporters that he and Trump now agree that the Syria problem involves more than Trump’s priority of ridding the country of Islamic State extremists. The two leaders indicated that they see Syria as part of a broader problem of instability in the Middle East, which includes Iran’s role in Syria and Iraq. That kind of strategic thinking bears little resemblance to Trump’s words in late March when he said it was time to leave Syria to others. “We got to get back to our country, where we belong, where we want to be,” he said March 29. His comments raised questions about U.S. intentions, including its commitment to the Syrian Kurds who have been the main U.S. proxy in fighting IS in Syria and who face an uncertain future. Since then, Trump has taken a markedly different course, including bombing three suspected chemical weapons sites in western Syria on April 13. In announcing that action, Trump said he was committed, along with France and Britain, to using “all instruments of our national power — military, economic and diplomatic” — to deter Syria from again using chemical weapons. And he said the U.S. would “sustain” this effort for as long as it takes. Two days later, Macron said France had persuaded Trump to stay in Syria and launch the airstrikes. “Ten days ago, President Trump wanted to withdraw from Syria. We convinced him to remain,” the French president said. On Tuesday Trump seemed to step even further away from his March remarks. 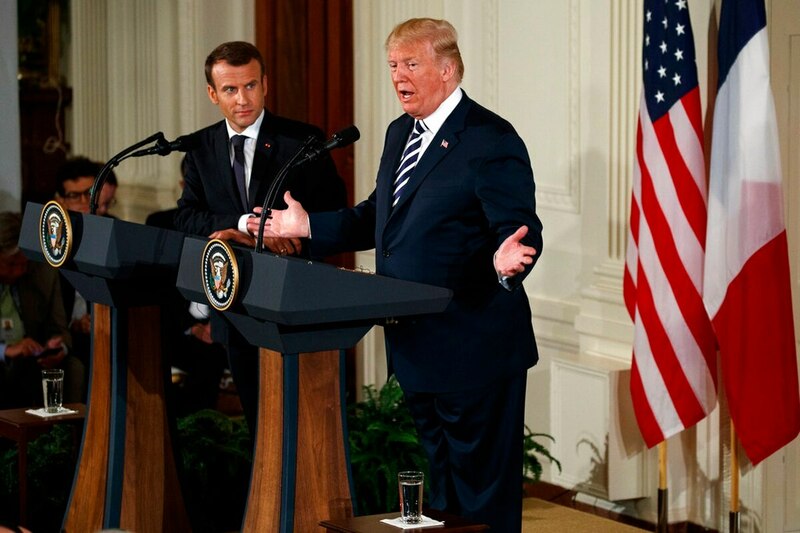 After saying he would “love to get out” of Syria, and claiming the U.S. had “done a big favor” for Iraq and other countries in Syria’s neighborhood by hammering IS, Trump said he and Macron discussed the downside of leaving. “Emmanuel and myself have discussed the fact that we don’t want to give Iran open season to the Mediterranean, especially since we really control it,” Trump said. His comment echoed a concern shared by others, including Defense Secretary Jim Mattis, that withdrawing from Syria now, while Syria’s political crisis is unresolved, would cede ground to Iran and enable its ambition to establish an overland pathway to the Mediterranean through Iraq and Syria. Trump stuck to his view that Arab nations should do more to prevent Iran from “profiting off” the U.S. success against IS. Even after Trump’s talk last month of a quick exit, Mattis stuck to his approach, arguing that U.S. strategic goals had not changed. He told a congressional hearing on April 12 that the Trump administration remained committed to finding a political solution to Syria’s seven-year-old civil war. On Tuesday, a spokesman for the U.S.-led coalition fighting IS in Iraq and Syria, Col. Ryan Dillon, told reporters at the Pentagon that the United States is not slowing down in Syria. In fact, he said, the number of U.S. airstrikes against remaining pockets of IS fighters in eastern Syria had increased in the past week.